Live commentary on the BBC Sport website and the BBC Sport App. 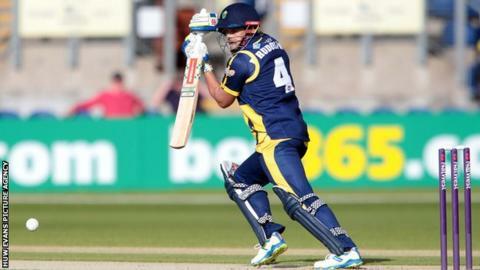 Glamorgan captain Jacques Rudolph hopes to capitalise on a run of home games in the One-Day Cup to catch up with their rivals after a two-point deduction. An opening wash-out at Nottinghamshire means Glamorgan still have a negative points tally after being punished for a poor pitch for a match in 2014. They now face Kent, Essex and Hampshire over six days at the Swalec Stadium. "It'll be nice to be back in Cardiff again. We've been on the road quite a bit," said Rudolph. "We know in terms of being two [points] down in this competition we've got to give it our best shot in terms of where we want to go in this competition. Unfortunately we find ourselves in this situation so we've got to give it 100%. "If it doesn't work out, it'll allow other players to step up and get some exposure." He added: "After this week we'll have a good gauge of where we are. If we're in with a chance, we're going to give it a full shot to try and qualify. "If we're not, it gives us an opportunity to rest people like Michael Hogan and Craig Meschede. "Looking further down the line when we play against Gloucestershire in Swansea [in the Championship], I would like to believe we can manage them so we're nice and fresh for that game." Kent's opener against Essex in Group B was also ruined by the rain. They will arrive in Cardiff on Tuesday having qualified for the T20 Blast quarter-finals despite having no overseas player because of financial restrictions. "They've done well in the T20. They've got away with it (not having an extra overseas player) but I don't think there's any formula as to how they've ended up with a home quarter-final," said former Glamorgan and Kent batsman Mike Powell, part of the BBC Radio commentary team. "[Sam] Northeast has head a great season for them, [Alex] Blake's done very well and [Mitchell] Claydon has done very well for them in the death bowling of the T20. "It might be different for them in the 50-over competition but they have hit a bit of form in one-day cricket, so it should be a great fixture against Glamorgan." Ruaidhri Smith is likely to continue to deputise for opening bowler Graham Wagg as he recovers from concussion suffered when he was hit on the head in the T20 Blast defeat against Gloucestershire.